We are absolutely thrilled with our bathroom renovation. We were very comfortable with Fred from the moment we met him. 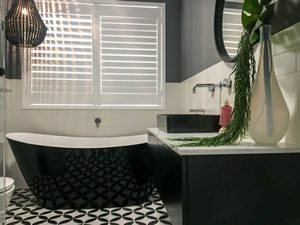 He was very thorough in providing us with a quote (which was very reasonable) and took the time to answer all our questions and concerns before, during and after the reno. His team of tradesman were very courteous and always went to great efforts to ensure all floor coverings were protected and did an amazing clean up job at the end of every day. Even Fred’s after sale service has been exemplary, often answering queries on weekends. We can’t recommend Fred and his team highly enough.